Clint Eastwood’s Mystic River is one of the most gut wrenching, haunting, stressful experiences one can have watching a film, and I’m only talking about the first ten minutes so far. On a quiet 70’s era Boston afternoon, three young boys play street hockey near their homes. After writing their names in freshly lain concrete sidewalk, a sinister ‘police detective’ (John Dolan, who I can never ever see as anyone but this character, he’s that affecting) hassles them and tries to lure the youngsters away. Two of them are wise to his game and escape. The third does not. This crime spurs a ripple effect into the future for these boys, as we see them grow up into very different and equally troubled men. 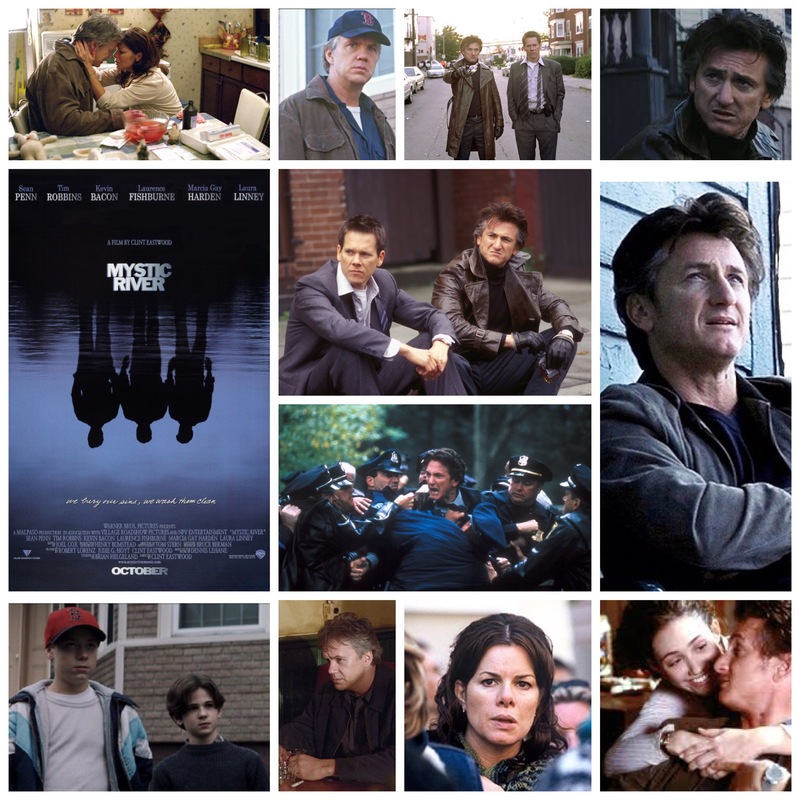 Jimmy (Sean Penn has never been better) is a small time hustler with anger issues, Sean (Kevin Bacon) a cop with his own demons and Dave (Tim Robbins), the boy who was successfully kidnapped and held all those years ago, is a fractured shell of a human whose damaged soul lashes against the whites of his eyes and prevents him from functioning normally. Malcontent comes full circle to find them once again when Jimmy’s young daughter (lovely Emmy Rossum) is found murdered, setting in motion one of the great tragedies you’ll find in cinema this century or last. Eastwood lets his actors quietly emote until the floodgates open and we see raw despair roil forth from three men who are broken in different ways, and how it affects everyone in their lives. Penn is tuned into something higher here, and I’ll not soon forget him arriving at the scene of his daughter’s murder. Robbins let’s the horror of buried trauma deep through the family man facade until we see the deformed psyche left beneath, while Bacon reigns it in for a performance no less memorable than the others. Marcia Gay Harden and Laura Linney are excellent as Dave and Jimmy’s wives, while Laurence Fishburne provides the faintest ray of humour as Sean’s partner. This is as much a murder mystery as it is an intense interpersonal drama, but the whole story is ruled by emotion; that burning need for revenge from several angles, the hollow pit of loss left behind when someone dies, the psychological scar tissue that trails in the wake of abuse, everything slowly coming to light as the grim, doom laden narrative unfurls. Tom Stern’s camera probes inlets along the harbour, sprawling neighbourhoods and hidden barrooms, Brian Helgeland expertly adapts the novel from Dennis Lehane and Eastwood himself composes a beautiful lament of a score, while the actors turn in galvanizing work. One of the finest films of the last few decades and not one you’re ever likely to forget, once seen.